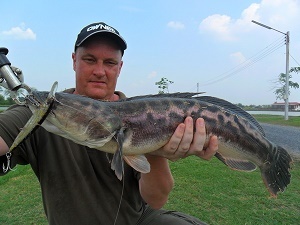 Another lure trip for Giant Snakehead fishing saw the Fishsiam team fishing at Pilot 111 fishing ponds near Bangkok. On arrival at the fishing ponds the anglers rigged up with swimbaits and jointed Rapala lures and cast towards the many showing snakeheads. After hitting several Giant Snakeheads only for the fish to drop off sport on the first fishing pond quickly dried up with the Giant Snakehead becoming visibly wary of our artificial lures. After a short break from the sun in the onsite restaurant the anglers moved on to the second pond and changed over to jerk baits in an effort to entice the predators to strike! After varying the rate of retrieve and allowing the lures to hit the bottom before gently bouncing them across the lakebed everyone began to start picking up Giant Snakeheads. Adopting a roving approach kept the anglers in touch with the Giant Snakeheads which began to regularly attack the artificial lures. All anglers landed several Giant Snakeheads with the majority of the fish weighing between the 3-4kg region. After landing several Giant Snakeheads each the fish obviously began to get wiser and moved off from the area of disturbance requiring the anglers to move position once again. Further cast produced more Giant Snakeheads with Boy leading the way by catching into double figures.